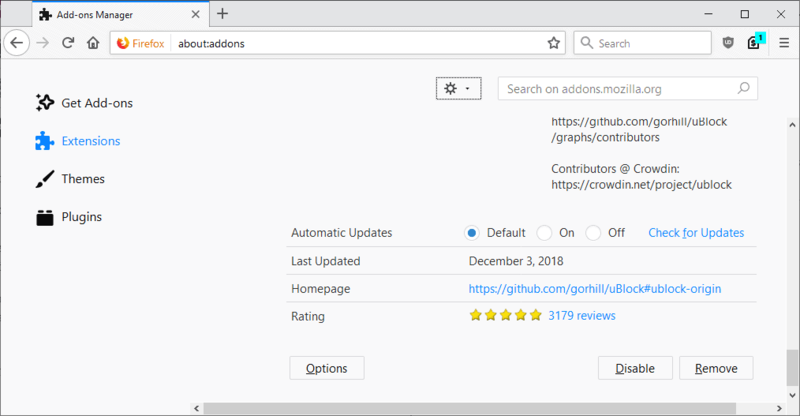 Extensions play an important part in the Firefox ecosystem; they add functionality to the browser, may improve privacy of users, or add features to sites that users visit in the browser. Mozilla implemented an automatic update system in Firefox that updates the browser and installed extensions and other components automatically by default. Firefox checks for updates frequently when automatic updates are enabled in the browser; this means that there is a delay between the release of an extension and the update of that extension in the Firefox browser. You may want to force extension updates, e.g. when a new version fixes issues that you experienced or when it introduces new functionality that you want to make use of right away. Problem is, it is not really clear how you can get Firefox to download and install the new version of an extension directly. There are quite a few options when it comes to immediate updates for extensions in Firefox. First thing you may want to do is check the installed version against the latest version. Load about:support in the Firefox web browser and scroll down to the Extensions listing. Each installed extension is listed with its version; compare that version to the latest version to determine whether you have installed the most recent version. One of the easier options that Firefox users have at their disposal is to run a check for updates from within the browser. Firefox queries the add-ons database to find out if updates are available for any of the installed extensions. These updates are downloaded and installed then if that is the case. Load about:addons in the browser's address bar to get the list of installed extensions. Click on the cogwheel icon at the top and select "check for updates". 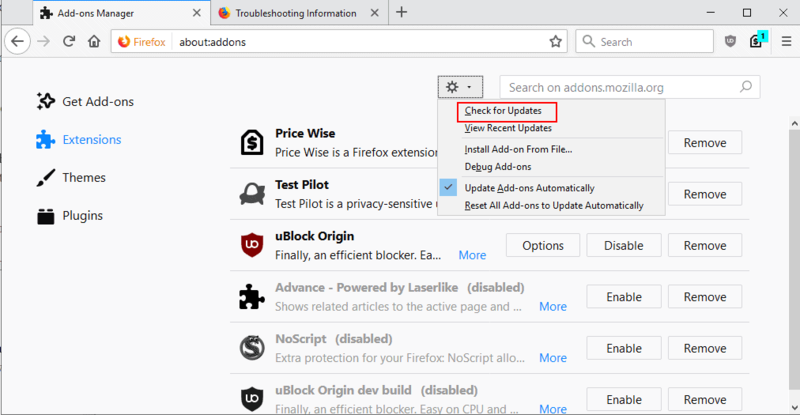 You have another update check option if you configured Firefox to never check for updates for extensions automatically, or disabled update checks for individual extensions. Select the "more" link next to any extension on the about:addons page. Firefox displays information and update configuration options for that extension on the page that opens. Activate the "check for updates" link there to run a check for updates for that extension. Firefox displays the link only if you have disabled update checks for extensions on about:addons. One of the great advantages of Mozilla AMO, the official repository for Firefox extensions, is that Mozilla maintains an archive of extension versions. The latest version of an extension is listed on that page; all you have to do is install it to update it in the browser. Scroll down to the "More Information" section and select the "See all versions" link. Click the "Add to Firefox" button next to the version that you want to install. Versions are listed chronologically on the page with the most recent version listed at the top. Firefox starts the extension installation process. Now You: Are add-on updates installed automatically in your browser? 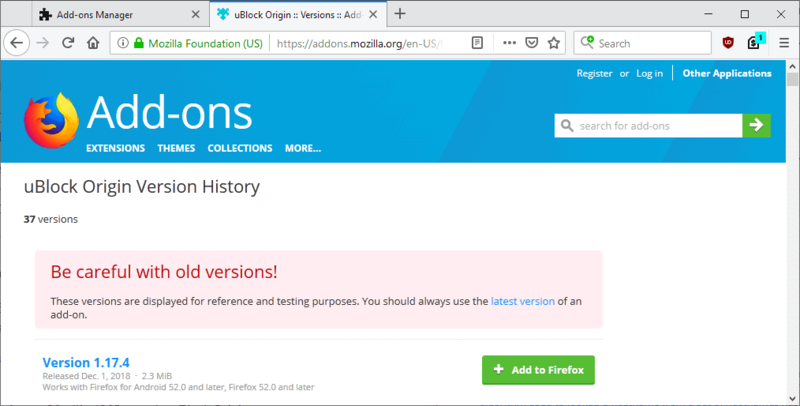 The tutorial guides you through the process of running manual update checks for Firefox extensions so that new add-on versions get installed asap. I only update manually as described in the article, once a day together with other updates (Stylus and ViolentMonkey scripts, uBO filter lists) and morning coffee. Automatic extensions’ update is disabled here. .. same here, without coffee but green tea + one extra caffeine tablet + firefox plugins (ok, i have only one plugin: “open h264 cisco video codec”). altogether, again a small contribution to lesser automatic firefox connections. important article. Same thing for me, I install manually all my extensions on my main browser, currently it’s Firefox 63.0.3 x86. Every extension is saved on an external disk drive. I don’t like the idea of my DDoSing Mozilla at fixed intervals. Nice to see that everything happening w/FFOx isnt ALL bad..